The vintage doilies shown on this page are the first four of a set of ten vintage crochet patterns contained in the BEETON’S BOOK OF NEEDLEWORK, written by Isabella Beeton and first published in 1870. The invention of the doily is credited to Mr. D’Oyley, a successful 17th century milliner. Mr. Doyle created and sold small fringed pieces of cloth to place under finger bowls, thus protecting the table from water marks. surfaces of furniture from scratches or stains, but they also offer a feminine style element to any room from the boudoir to the basement. The Beeton Book of Needlework uses the word “D’Oyley” in all its crocheted doily patterns, but regardless of how you spell the name, the intricate designs in these doilies are clearly heirlooms in the making. 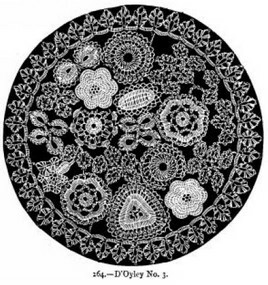 If you look at the doilies shown here, you’ll see many of the design elements are repeated, but in such a way that each doily remains, like a snowflake, a uniquely beautiful creation. 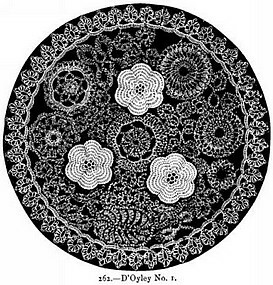 If you’d like to try a vintage crochet pattern, these ten doilies offer an interesting variety of stitches and design combinations. are usually available through Amazon. You can also view or download the entire book for free from Project Gutenberg, but please be aware that the download is large, especially for those on slow connections.